The study of weather can aid in understanding the narrow band of conditions needed for life to thrive. Whether it is our own comfort or the farmer growing food that ends up on your table, weather affects all of us. Climate change has been in the news for the past several years. Those who study earth processes recognize that our planet’s climate has changed since the planet was formed. Based on that history, there is every reason to expect it will continue to change. Meteorology is the study of the atmosphere. Air temperature, air pressure, water content in the air, and weather events are all part of meteorology. Our work with farms and farmers constantly reinforces how weather affects crop production, soil health, and water quality. Understanding weather is important! 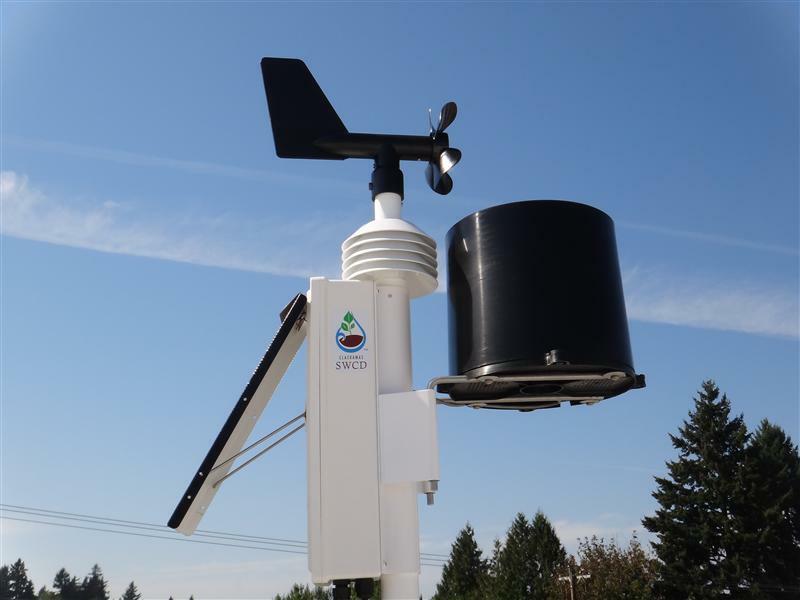 To help in understanding local weather, the Clackamas County SWCD operates a weather station at our office in Oregon City. Live data from the weather station is streamed to the internet at RainWise.net and at Weather Underground. Our station is a solar-powered Rainwise MK-III unit that wirelessly transmits wind speed, humidity, barometric pressure, rainfall, and temperature. Learn more about Clackamas County weather patterns and the Climate of Clackamas County.